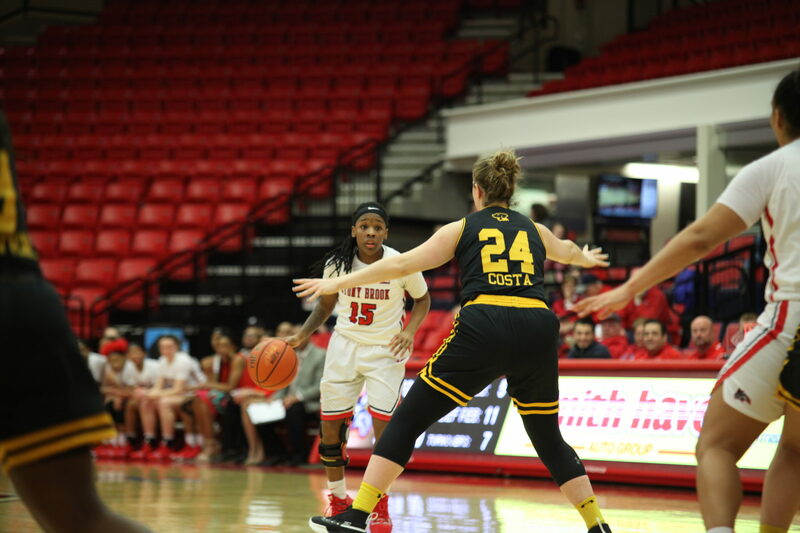 Stony Brook Women’s Basketball topped UMBC 57-44 at home on Wednesday, Jan. 30, earning a double-digit margin of victory since the 82-63 win over New Hampshire on Jan. 12. The game was decided by the plethora of three pointers from senior guards Shania “Shorty” Johnson and Jerell Matthews. The duo converted on nine shots from three throughout the game, six coming from the first half. Redshirt-sophomore forward Oksana Gouchie-Provencher, sophomore guard Jonae Cox and freshman guard Anastasia Warren all scored a three of their own. Stony Brook sunk nearly 43 percent of their three-point shot attempts and showcased one of their best shooting performances from beyond the arc of the season. Defensively, the Seawolves held the Retrievers to just one 3-pointer in the first half and 18 percent for the game’s duration. The Seawolves started out on an 11-4 run in the first quarter by mixing authoritative offense with stifling defense. They were able to keep the lead the whole game and prohibited UMBC from producing a significant scoring run of their own. Stony Brook was physical on defense, forcing UMBC to make 14 turnovers and excelled in capitalizing on scoring opportunities with 18 points off turnovers. Although Stony Brook led for the entire game, UMBC outscored them 22-17 in the fourth quarter. The senior leadership shined through in this game with Johnson and Matthews contributing 17 points each, retaining the lead. Matthews was able to shoot four of her five 3-pointers in the first half while Johnson knocked down four of her own. Johnson rebounded from a lackluster performance against UAlbany by converting a four-point play in the first quarter, dishing out nine assists and a steal which led to a fastbreak layup. Cox was active in the paint, grabbing a career-high 10 rebounds and dropping five points as well. This victory was Stony Brook’s fifth over an America East conference rival this season and improves its overall record to 16-5 record overall. The Seawolves are off to their best overall start since the 1993-94 season, when the team finished 18-6. Stony Brook will travel to Hartford for a rematch of the conference home opener on Saturday, Feb. 2 at 2 p.m.